Ask a boy between the ages of 8 and 14 what he wants for his birthday and you are as likely to hear clamors for “Yu-Gi-Oh! Exodia” as you are for old assorted favorites like Monopoly or a Hot Wheel play set. "Yu-Gi-Oh!" is a Japanese animation series about a game of dueling monsters similar in some ways to "Pokémon." 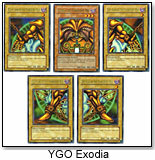 Exodia is an unbeatable creature that brings automatic victory to the player who manages to summon the whole of its five parts. There is an actual card game for the cartoon, just as there is one for Pokémon. It is not your traditional card game, where everybody plays from the same deck, but instead belongs in a relatively new category that is just over a decade old. Collectible card games (CCG) or trading card games (TCG) are similar to baseball trading cards — with a game built into them. A typical CCG is packaged in starter decks that offer enough cards each (usually around 50-60 game cards) to begin playing, and “booster packs” with 10-15 randomly inserted cards of various rarity. 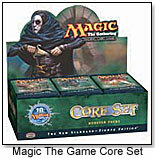 A player selects cards from his collection and constructs a playing deck. He then plays it against another player who has built his own deck from his collection. Neither can be exactly sure what cards are in the opponent’s collection and, subsequently, put into his deck. The game therefore involves a great deal of strategy, surprise, and luck. The idea of CCG is analogous to a set of baseball cards with rules to gather and teams to customize for competition. Just as inferior ballplayers are more common and less valuable than all-stars, the less powerful (and more prevalent) cards in a CCG are less valuable than the rare, powerful ones. Cards that can award an instant victory — such as Exodia — are the equivalent of a perennial MVP-caliber player like Barry Bonds, and thus rare to obtain. One could ostensibly sort through an entire box of booster packs without landing one. The hope of getting these precious cards – not just to strengthen a deck but to show off to fellow players – is what drives sales. Like baseball cards, a secondary market has sprouted for re-sale of single cards. For example, if Junior has rare cards he’s willing to part with, he could sell them and recoup partial or, in some cases, even all monetary investments. And if he is a good player, he could possibly try his luck on one of the tournament tours, with the top prize as high as $25,000. By the way, a Yu-Gi-Oh! Exodia card —any one of the five body parts— currently fetches from $29.99 up to $89.99 each. Not bad for a lucky draw in a $3.49 pack.